Welcome to Cassidy's of Camden Street. Not to be confused with the pub of the same name on Westmoreland Street, this is a great old public house for a matey meet-up or a solitary drink with only the newspaper for company. If you're a people watcher, grab a ringside seat at the window and watch the world pass by. The pints are renowned for being expertly pulled, and are on offer at reasonable prices. Quiet on an average weekday afternoon, Cassidy's really gets going on weekend evenings, and can be absolutely packed on Friday or Saturday nights. 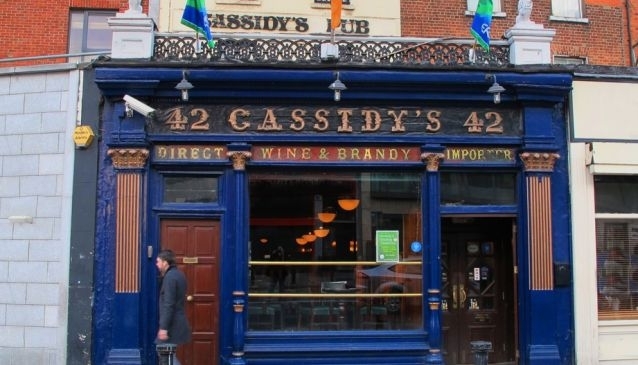 There's a beer garden out back, and if you enjoy traditional Irish music with your gargle, pop in for one of Cassidy's Sunday Sessions - ballads and folk are played every Sunday from 8pm, and all are welcome.